The Internet provides a huge window of opportunities, helping us to gather information, communicate, and take our students outside of the four walls of the classroom to experience what the world has to offer. As with all technology, we want our students to use their devices safely, respectfully, and appropriately. Celebrated since 2004, Safer Internet Day was created to inspire a national (now international) dialogue to promote positive use of digital technology and create a safer and better online community. Note: Although the majority of students this age may not be accessing the Internet on their own, they may be interacting with other forms of online technology, such as video calling with family members, viewing digital photos, and playing child-centred games. It is important to remind even very young children that safety rules apply to technology too. What do you do when you want to cross a busy road? What would you do if nobody was home when you got off the school bus? What would you do if somebody asked you to help find a puppy in the park? What other rules do you know that keep you safe? Why do they think safety rules are important? How many have a computer, cell phone, or tablet in their home? Who is allowed to use these devices in their home? If they play games on a digital device, what games do they play? Is there a password they have to enter before they can access the device? Is it their own password or their parents’? Have students signal yes (It is ok) or no (It is not ok) to each of the following situations by giving a “thumbs up” or “thumbs down.” Explore their reasons for each. Your older sister is texting a friend on her cellphone when a message pops up. It says, “You have won a new phone! Just meet me in the park at 2:30.” Should she go? Your friend has a new game for her tablet. The game company wants your friend to give them her name, phone number, age, and school. Should she do it? Your brother uses a password to open his cell phone every day. Is this a good thing? Who should he share this password with? Your sister has a friend that just got a new cell phone. She has been running all over the place taking funny pictures of people and then sending them to all her friends. Is this a good idea? Why? Never give anybody you don’t know any personal information about you. Never share pictures of people or information about them without their consent. Tell an older brother or sister or parent if you see something on the Internet that worries you. Note: An excellent online game resource for children this age is available through Media Smarts found here. By this age, many students will be engaged in some way with online media. 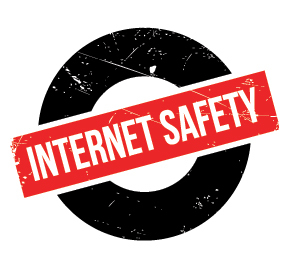 It is important to remind them that certain rules of use will help them to get the most out of their online communication and can also keep them safe. Ask students about their media use. How many TV’S do they have at home? How many computers or tablets, cell phones, video gaming devices, etc., are in their household? Never use your real name online. Never share any personal information (your school address, etc.). Never share a photo on line of you or anyone else. Keep your password safe and don’t share it with friends. Tell a trusted adult if you are worried about something you see or hear online. Invite the students to make posters that remind others of these important rules. Post around the room. For more information, check out the Media Smarts resources for this age group at http://mediasmarts.ca/tipsheet/internet-safety-tips-age-8-10. Additional activities can be found on the Canadian Centre for Child Protection’s interactive website, “Zoey & Molly Online”. Aimed at students aged 8 to 10, this site helps them understand what it means to be safe while playing games online, as well as the risks associated with sharing their personal information and sending pictures online. The Media Smarts website has created a helpful way to identify what is true in the online content we encounter, and what is not. How much of what you see and hear online do you believe is real/true? Have you ever shared or spread an article or piece of news online only to find out later that it wasn’t true? Do you know anyone who has? What techniques do you use to decide what to believe out of the content you see online? Explain that there are effective ways to sift through all the information you receive. One helpful approach is the similar to the format reporters use to get a story —the 5 W’s. If possible, go online with your students here. Walk through the set of 5 W’s recommended by Media Smarts. What surprised you the most as you read these tips? Has this changed the way you will use and verify what you read online? How and why? Have students to discuss in pairs how techniques such as those described above could affect the way they interpret and use online content. Ask volunteers to share their answers. Embedded in the above tip sheet from Media Smarts are some videos that further reveal ways that “false news” can be generated. Depending on your perception of your students’ media habits, you may wish to view them as a class.